Just published in BSSA, we quantify variations in source parameter estimates at closely spaced stations. Accurate estimates of course parameters and their uncertainties are essential, particularly when the results are used in the comparisons among different studies over a range of earthquake magnitudes and locations. 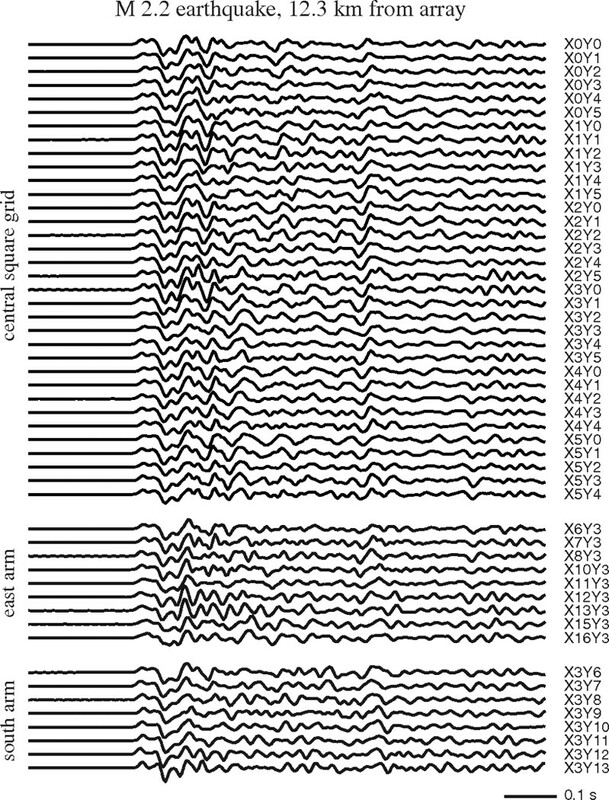 We use an empirical Green’s function method to spectra estimated using the seismic coda to investigate earthquake source scaling. Our data span a magnitude range from Mw 3.0–Mw 7.1. We find that a constant scaled energy provides a reasonable fit to the data, with no dependence of scaled energy on seismic moment. Published in JGR. g can be generated from ambient noise. 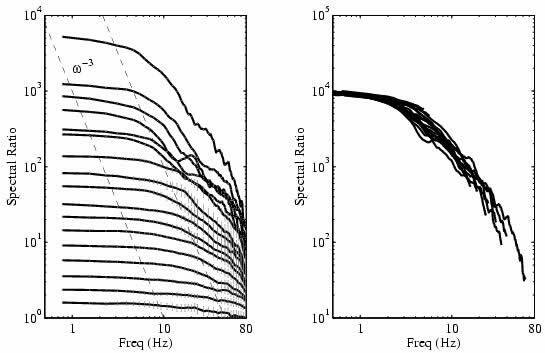 Figure above shows the IRF of the Factor Building in UCLA at two different frequency bands. The signal that is sometimes regarded as noise, the ambient seismic field, has recently been shown to provide important information about Earth's structure. By looking at the spatially coherent signals between seismic stations (and under certain conditions) we are able to extract the Green's function of the medium, as if one station behaved like a source and the others record the response of the Eartth's crust and upper mantle. In my research I have been focusing in additional information observed in the amplitudes of these Green's functions, both in time and frequency domains. 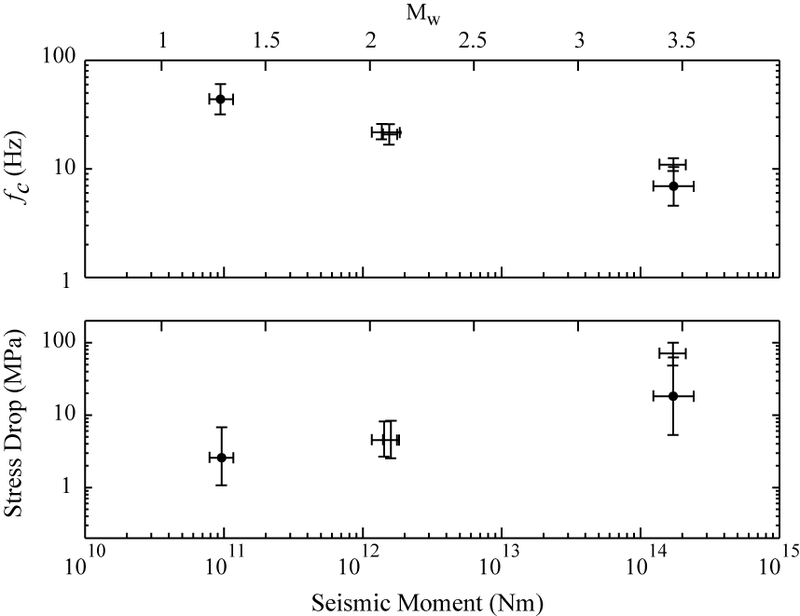 The physical mechanism responsible for intermediate-depth earthquakes is still under debate. In contrast to conditions in the crust and shallow lithosphere, at temperatures and pressures corresponding to depths >50 km one would expect rocks to yield by creep or flow and not by brittle failure. 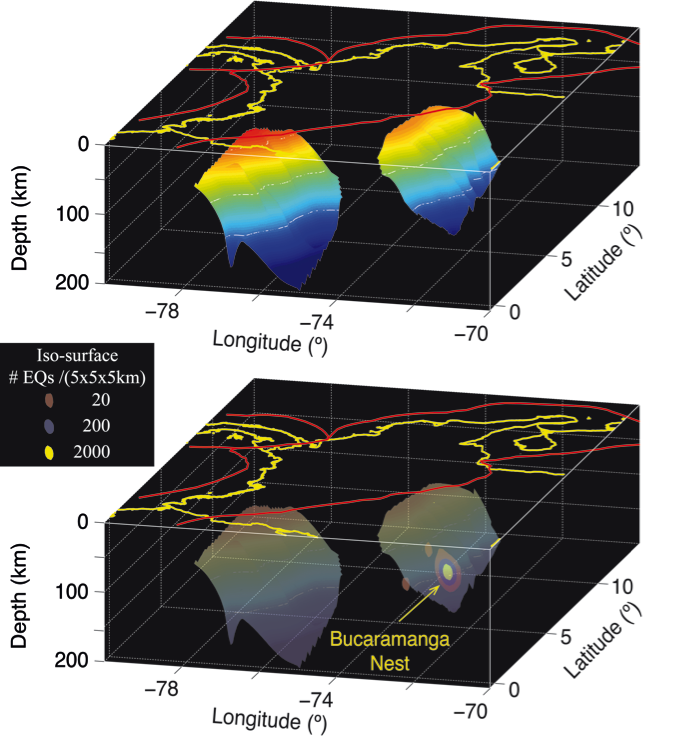 Earthquake nests represent a region with high earthquake concentration that is isolated from nearby activity, and one such regions is the intermediate-depth Bucaramanga Nest. Given the nature and characteristics of this nest, it can be thought as natural laboratories for understanding the mechanism of intermediate-depth earthquakes. I am studying this place using a wide variety of seismological tools to resolve this issue. 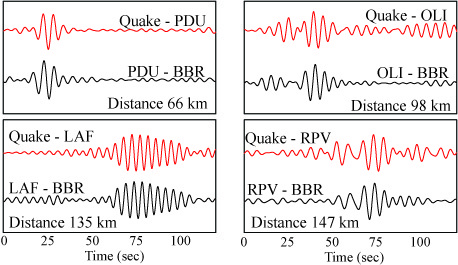 A major question in seismology is whether the earthquake process is self-similar. Is a M = 8.0 earthquake simply a M = 2.0 earthquake scaled by a large factor or is the physics of the two processes different? There is continuing interest in the question of earthquake scaling and there is currently a debate regarding the self-similarity of the earthquake rupture over their entire size range. Seismologists use some parameters (such as seismic moment, stress drop, and radiated seismic energy) to describe the earthquake rupture. The behavior of some of this parameters as a function of the earthquake size provides information about the physics of the rupture process. The Quake-Catcher Network (Red Caza Terremotos in Spanish) is a collaborative initiative for developing a low-cost seismic network. The network uses sensors connected through the world-wide web. I am working on developing the network here in Colombia, installing them in homes and schools throughout the country. This is part of a collaboration with Stanford University and UC Riverside. Part of the difficulty in studying earthquake source scaling is the accurate estimation of the source parameters, accounting for seismic attenuation, path effects, etc. These factors lead to considerable uncertainties in the estimation of stress drop or radiated seismic energy. What is often missing in many studies is these measurements of uncertainty, which are of key importance when comparing two results, or when comparing different methods of analysis. The are multiple applications in geophysics (e.g., seismology, climate, electromagnetics), engineering (e.g., structural engeneering) and even the social sciences (e.g., economics) where relevant information may be extracted from the frequency content of the spectrum. In 1982 David J. Thomson introduced the multitaper spectrum algorithm which has been widely used since. In my analysis of the earthquakes I have used the multitaper method extensively. I wrote a Fortran 90/95 Library (mwlib.html) with many more features than other available codes. The algorithm allows for the estimation of the power spectra of a signal, confidence intervals, phase information, correlations, coherency, deconvolution, etc..